With a really impressive modern ambience, at this Chinese restaurant on Church Street you HAVE to order the Meal In A Box that makes your life really simple. You can create your perfect meal by just choosing Base + Add Ons + Sauces and Toppings. If you want to have an elaborate meal, they have everything from soups and starters to Honey Date Wontons (we love)! Read more about it here. One has been led to believe that there are only delicious Bengali sweets to be had here, but, you can also tear into a plate of lip-smacking Luchis served with Dum Aloo and Bengali dal. It is simply outstanding and perhaps the best value for money lunch in this area. Check it out here. A brilliant buffet is definitely a meal you should opt for at Tao. For a decently priced INR 550 plus taxes, (considering it’s the CBD), you get everything – a drink, starters, soups, mains and desserts. What more do you need? If you feel like a burger kind of day, head straight to HRC just off MG Road. Go for the Classic Beef or Chicken Burger or if you appetite seems to be particularly good; you must try The Big Cheeseburger. They also have executive lunch combos from time to time, so be sure to ask. Read more here. If you’ve lived in Bangalore long enough, you will constantly crave for Andhra Meals at least once a week. In the CBD you have a few choices but Nagarjuna seems to be the popular choice. If you feel like a changing it up a bit, you can go to Bhimas too – we ain’t biased! Either way, read our verdict on both at this battle here. Escaping from one’s air-conditioned environs to the generous canopy of grand, old banyan trees should be enough reason. But should you need more, they’ve also got an enormous, filling Channa Batura that will lull you into slumber and a dark, rich filter coffee to wake you back up. Or just pick the usual dosas and coffee. Check it out here. If you and bae want to catch up for lunch, walk straight to Barton Center and head up to Ebony. You can catch the brilliant buffet spread that’s on for only lunch through the week. Feast away and enjoy the breeze on the 13th floor with a bird’s eye view of CBD. We recommend the Kebab platter and the Curry Bowls – pretty awesome! Check out our love for the restaurant here. They’ve got an executive lunch at Shiro on weekdays, where you can pick an appetiser, a main dish and a dessert from a limited menu of their crowd-pleasers. At INR 650 for the three course one, and INR 770 for four, it's quite the bargain, for an otherwise rather expensive place. Take your pick from delicate, stuffed dumplings to sinful chocolate desserts. 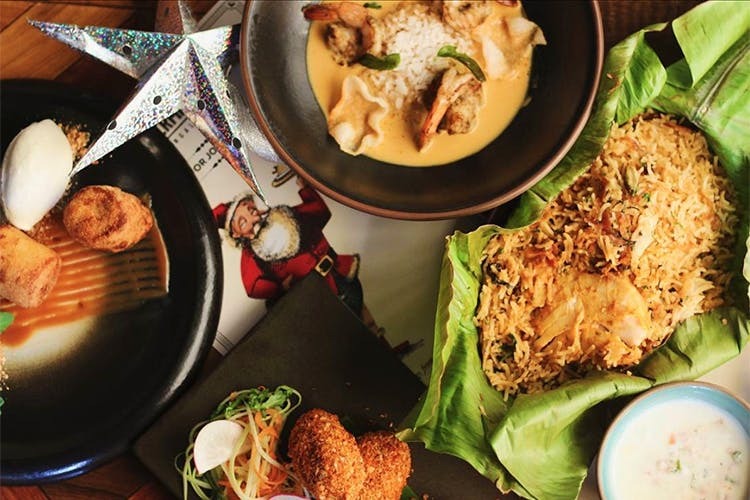 With a huge buffet spread that is sure to fill your stomach (and heart) to the brim filling and then some, Chutney Chang masters in pleasing everyone with its multi-cuisine spread. Come here on a Friday for a long lunch with your office pals for a slow and relaxed lunch. We hear, it's the longest buffet in the entire city! With zen ambience, a charming garden, and picnic furniture, come here on a slow day to enjoy a great club sandwiches, Chicken Quiches or pies for the superior continental lunch. Soak in the ambience and catch up on office gossip while sipping on hot coffee/tea. Read more here. If you need you fix of a proper meal, but don't want to go overboard, The Permit Room is perfect for you. Skip the salads and starters if you're in a rush and opt for their pre-plated meals. Our favourite is the Meen Moilee with rice, or Avial In A Bowl. Those who don't have meetings post lunch, you have to try the Highway Pandi Curry with ham and peas upma. Want to keep it simple? Order Donne Biryani. Read more about it here.